The history of opium evokes images of wars and imperialism across the globe. This large history often overshadows the prevalence of opium in America. Even before medical morphine was first extracted, opium and its derivatives were used medically and mixed in tonics. Opium, though, causes severe withdrawal, which makes it a highly addictive substance. Early nineteenth-century Simsbury, Connecticut, residents were fully aware of the dangers of opium, especially when the Congregational Church buried Mary Woodbridge, an unmarried woman who committed suicide via laudanum. From 1806 to 1861, Reverend Allen MClean served as minister of the Congregation Church in Simsbury, Connecticut. In town history, he was remembered fondly for his generosity, benevolence, and temperance advocacy. He left a journal record of all of the people he eulogized while serving in Simsbury. On October 28, 1831 he noted a particularly tragic death. MClean wrote “In a state of derangement [Mary Woodbridge] put an end to her present existence by taking laudanum. She was naturally a very sensible and serious minded woman.” Mary’s laudanum use begged the question: How popular and available was opium? Laudanum was an opium derivative that was prescribed by doctors but also commonly prepared by laymen. 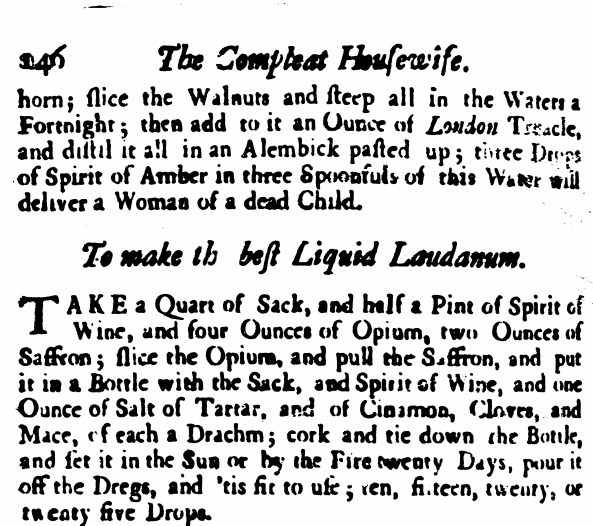 The Compleat Housewife (1742), a woman’s domestic manual, taught the reader how to prepare laudanum and recommended it for a variety of aliments, ranging from stomach inflammation to a child’s insomnia. Medical journals recommended laudanum and other opium derivatives to treat pain. As a popular medication, one can assume that most residents of nineteenth-century Simsbury had access to opium and relied on it regularly, as further evidenced by the early temperance movement in Simsbury. While there were not any professional studies done of opium addiction in the early nineteenth century, temperance manuals and societies discussed the effects of opium dependency. Temperance manuals warned against laudanum abuse alongside spirit abuse. In Simsbury, the first temperance society was the Aquatics Society, formed in 1805 by Benjamin Ely. Temperance societies often formed as a reaction to a problem. A temperance society was not necessary if there was not alcohol or opium dependency. By forming one of Connecticut’s first temperance societies, Simsbury residents exposed addiction and dependency issues. At the same time, the residents identified negative effects of addiction and sought to eradicate it. One force the Aquatics Society needed to fight was the romantic notions of opiate use in popular literature. Popular literature mentioned opium and even glorified laudanum use. In 1800, Thomas De Quincey published Confessions of an English Opium Eater about his opium and laudanum addiction. While he acknowledged the destructive implications of drug use, De Quincey seductively described the effects of laudanum. His alluring descriptions sparked readers’ curiosities about drug use and how it effected people’s mindset. Opium “with respect to the temper and moral feelings in general, gives simple that sort of vital warmth which is approved by the judgement.” When he used opium, he felt he gained acceptance. Reverend MClean’s eulogy contrasted the term “derangement” against Mary’s regular “sensible” temperament. This suggested that when Mary consumed laudanum, she acted out of character. But Mary needed “vital warmth” to help herself cope with her own personal tragedies. Mary Woodbridge was descended from one of Simsbury’s first congregational ministers, Dudley Woodbridge. As a girl, she attended Hopmeadow School, and her father Haines Woodbridge was respected and served on the School District Committee. But Mary’s life began to unravel in 1818, when her mother died and ten years later, her father drowned himself in the Farmington River. In letters from her brother in Middletown, he worried about her distraught feelings. With her brother away, her parents dead, and her unmarried status, Mary felt isolated with no one close to confide in. This led her to rely on laudanum. Mary lived in a world where she was under strict moral and temperamental limitations. As she consumed laudanum, the pressures of being a virtuous woman and the tragedies of losing her parents disappeared and were replaced with acceptance. The Aquatics Society’s potentially presence in town forced Mary to “conceal [her] opiate using” to avoid judgement. Drug use and dependency remain a tremendous problem today. Thinking about the history and patterns of drug use and care can instruct us and give new perspectives on how to behave towards today’s problems, as there are so many similarities. The Aquatics Society formed to promote temperance in Simsbury but may have further isolated Mary Woodbridge to avoid judgement. But, at the same time, Mary Woodbridge’s death showed how residents in nineteenth-century Simsbury treated suicide with compassion. Although Mary committed suicide, she was not ostracized. Mary was respectfully given a funeral and buried in the town cemetery. Morgan, Howard Wayne. Drugs in America: A Social History, 1800-1980. Syracuse, NY: Syracuse University Press, 1981. Norton, Mary Beth. Liberty’s Daughters: The Revolutionary Experience of American Women, 1750-1800. Ithaca: Cornell University Press, 1996.